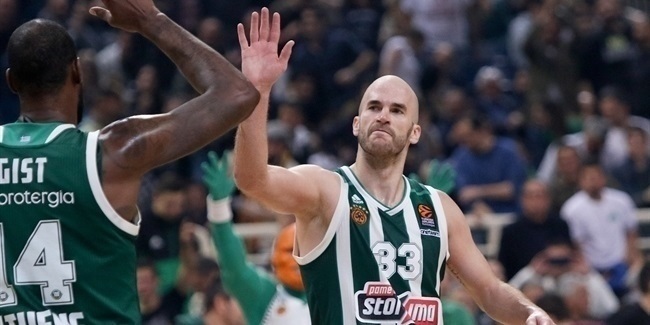 Panathinaikos OPAP Athens and Khimki Moscow Region faced a key game on Friday in the fight for the Turkish Airlines EuroLeague Playoffs. They say that such decisive games tend to be slow-paced and low-scoring, but that was not the case in this one. Indeed, Panathinaikos and Khimki made history by playing the highest-scoring first half in the EuroLeague in almost 15 years. Panathinaikos, in particular, played near-perfect basketball before halftime, which ultimately made the difference in the game. The Greens thrilled their fans by hitting 18 of 22 two-point shots (81.8%), 5-of-10 from downtown (50%) and 14-of-16 free throws (87.5%). They also dished 15 assists -- 8 by Nick Calathes alone -- while picking up just 2 turnovers the 8 they forced on Khimki. When the dust settled, Panathinaikos led 65-50 at the break. One Panathinaikos player was particularily inspired: Deshaun Thomas. After not scoring more than 14 points in a EuroLeague game this season, he poured in 22 on 9-of-9 two-point shooting in the first two quarters alone! It was not just Thomas, however, as the team was unstoppable on offense from the very beginning of the game. The Greens scored 33 points in the first 10 minutes, tying the club record for most points in a first quarter at home. Panathinaikos had previously scored 33 points at home in a first quarter only against DKV Joventut Badalona (33-15) on December 14, 2006. Not happy with that mark, Panathinaikos kept rolling, but so did Khimki. The visitors piled up 29 second-quarter points of their own. 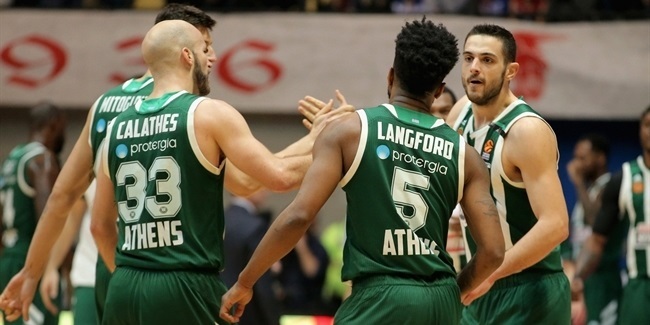 As the teams headed back to their locker rooms, Panathinaikos had 65 first-half points, which was both a a club record and the second-best scoring half by any team in EuroLeague history. Kinder Bologna holds the all-time record with 66 points against Cibona Zagreb on October 25, 2000. Two more teams scored 65 points in a first half: Nizhny Novgorod against Anadolu Efes Istanbul in 2015 and Kinder against Estudiantes in 2001. The record for most second-half points belongs to Panathinaikos, with 64 against Chorale Roanne on November 21, 2007. There is more to this high-scoring, historical first half. The two teams combined for 115 points in those first two quarters. That is the most points in a EuroLeague first half since December 2, 2004, when AEK Athens and Maccabi Elite Tel Aviv combined for 115 points (54-61). The all-time record is held by Ural Great Perm and ASVEL Villeurbanne, who combined for 116 points (59-57) on January 30, 2002. It was delight to see any EuroLeague fan in general, but for each and every Panathinaikos fan in particular!